The cuisine in Abruzzo varies from province to province and reflects the mountain, temperate and maritime climates of the area. 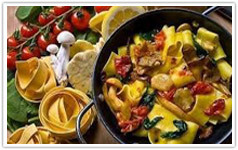 Teramo, an area covering all threes climates is thought by many to have one of the most sophisticated and varied cuisines in the whole of Italy - fantastic fresh seafood and many different mountain delicacies. Timballo - a lasagne-like dish which, in Teramo, contains lamb, pork and eggs. Abruzzese antipasti - a must at the start of a meal in this area, include local dishes such as Salame Aquilano - a salami made from pepper and pork, and Ventricina (local to Chieti and Teramo), a salsicce containing fennel, orange peel and hot pepper. Local cheeses are prepared in many ways and all these dishes are served alongside seasonal vegetables, grilled and doused in the region's famous olive oil. Pasta dishes are too numerous to mention but the local mugnaia is always worth a try. Pastas of all shapes, sizes and textures are served with sauces made from seafood, meat and vegetables. Little beats a real tomato sauce made from tomatoes ripened by the Italian sun! Meat and fish dishes are dominated by lamb and seafood. Game is usually in abundance too - pheasant, deer, wild boar etc. 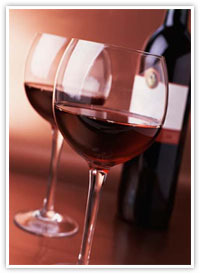 Montepulciano d'Abruzzo - a full-bodied, dry red. Cerasuolo d'Abruzzo - a dry, fruity rosé. Trebbiano d'Abruzzo - a crisp, dry white. Controguerra d'Abruzzo - a full-bodied red. However the supermarket shelves are full of local wines which are very inexpensive and definitely worth a try - there is something for every taste! Also pop into the local wineries with your 5 litre flagon and fill up at the wine pump - tremendous value for the wineries' basic red, white and rose.